The National, Abu Dhabi’s English-language newspaper, hasn’t had a quiet week. First comes a blog post which The National admitted was ‘one of the most controversial ever’ in the paper’s five year history. The blog, which was written by an intern journalist named Ayesha Al-Khoori, was pilloried for its description of her driving habits and speeding even though she herself was attempting to argue that lowering the UAE’s driving minimum driving age from 18 would be a mistake. This blog, which garnered hundreds of responses and mentions on the comments section as well as on social media sites, was followed by an attempt at an apology which for me seemed to miss the point (Ayesha claimed her message was lost, but I’d argue that there was no consistency in her initial message). For a review of the blog and The National’s editorial guidelines including how it reviews and edits work (which didn’t seem to be the case with Ayesha’s blog) then read this piece by Mita56 which sums everything up nicely. To top off a bad start to the week, someone made a serious error when writing The National’s daily electronic newsletter (have a shufty below). Have a look and spot the boo-boo. It’s a big one. If you didn’t spot the mistake, I’ll give you a hint. 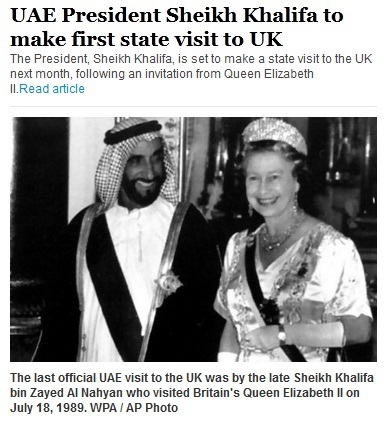 The late person referred to in the photo-caption should be the founder of the country (Allah yurhamu) rather than HRH his son who is very much alive and is the President of the United Arab Emirates. The National has been stung recently by a couple of tell-all pieces by ex-journalists. One of the most recent was Tom OHara, who wrote a warts-and-all account of his two years in Abu Dhabi in the American Journalism Review in December 2012/January 2013. You can read his revealing piece here. I was at the launch party for The National in 2008 and remember the roster of journalists on display. There was a Pulitzer-prize winner reporting for the paper even. Hopes were high that we’d have a newspaper with the temerity to tell it like it was, which is still a rarity in the Middle East. Over the years I’ve looked forward to reading The National’s copy from a group of journalists whom I have dealt with and whom I think very highly of. As a former journalist I respect and admire good journalism. In today’s Gulf we need more quality content to explain the why behind the what. My hope is that The National’s management steer the paper back to what it aimed to be five years back, to “establish an institution on par with some of the greatest newspapers in the world.” Trials and tribulations are all well and good (unless you’re the person behind the drama), but The National needs to raise its standards and focus our attention back on the quality of its content. The National, we need you more than ever. This entry was posted in Journalism, United Arab Emirates and tagged Abu Dhabi, Ayesha Al-Khoori, journalism, Mita56, the national, United Arab Emirates by alexofarabia. Bookmark the permalink. When I lived in Abu Dhabi around 2010-11, I’d read the National sometimes. It seemed like they did try to report on stuff that the Khaleej Times and other English-language papers wouldn’t. But I never had a good insight into what was going on with the National (apparently a lot’s happened since I left!) I guess they’ve fallen down on the job.